The word "vegetable" comes from the Latin vegetare, meaning "to enliven or animate,” which is a perfect definition, as vegetables truly do give us more life. There is a large body of research (and it keeps growing daily) indicating that vegetables can prevent many diseases, especially chronic degenerative diseases such as heart disease, cancer, diabetes, cognitive decline, vision deterioration, arthritis and advanced aging. Can you imagine if a pharmaceutical drug were able to do all of that? We can hardly read a newspaper or listen to the news without learning of yet another study showing the health-protecting benefits of consuming several servings of vegetables daily. The challenge is that most people simply don't consume the medically recommended five to nine servings of vegetables a day. Sadly, the average person consumes less than two servings daily and is thus deprived of the health benefits and protection that vegetables offer. Synergized® Ingredients helps solve this challenge by offering Synergized® Vegetable powders: certified organic, kosher, concentrated bioactive vegetable powders that make it easy and convenient for you to offer your customers all of the health benefits of fresh vegetables. Synergized Vegetable powders are a technological breakthrough in capturing and retaining the fragile nutrients and phytochemicals in fresh vegetables. 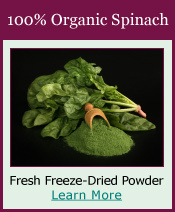 Using our exclusive low-temperature, oxygen-free drying processes, we are able to offer both vibrant whole vegetable powders and radiant vegetable juice powders with no equal in the industry. Our freeze-dried vegetable powders contain the powerful and proven health benefits of real organic vegetables, including all of their naturally occurring antioxidants and their phytochemical profile. 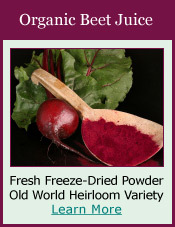 Synergized Ingredients' organic beet juice powder offers betaine; and our organic spinach powder, and organic kale powder are a source of lutein. Other phytochemicals found in Synergized Vegetable powders include sulforaphane, glucosinolates, polyphenols, flavonoids, chlorogenic acid, vitamins, minerals, anthocyanins, ellagic acid and quercetin. 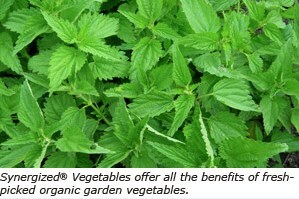 Bursting with nutrition and health benefits, our whole vegetable and vegetable juice powders offer all the goodness of fresh-picked organic vegetables right from the garden, yet in the convenient form of free-flowing powders, ready to use in any type of formulation including dietary supplements, green superfoods, food bars, functional foods, and beverages.